CBO director Doug Elmendorf testified today about the long-term effect of extending the Bush tax cuts, and his chart showing the difference between extending only the middle-class cuts vs. extending all the cuts has been making the rounds. Basically, CBO says that although temporary tax cuts would stimulate the economy right now, the effect of permanent tax cuts would be strongly negative in the long run because they’d blow up the deficit and crowd out private investment. I was going to comment on this, but after reading through the full report it looks to me like the chart is wrong. As near as I can tell, it’s drawn from data in Table 4 (page 31) but somebody in the graphics department drew the bars wrong. Take a look at the effect of a permanent extension. The original chart (in blue, below) suggests that under two different scenarios the long term negative effect of full extension is equal to or less than the negative effect of just a middle class extension. That doesn’t really make sense. 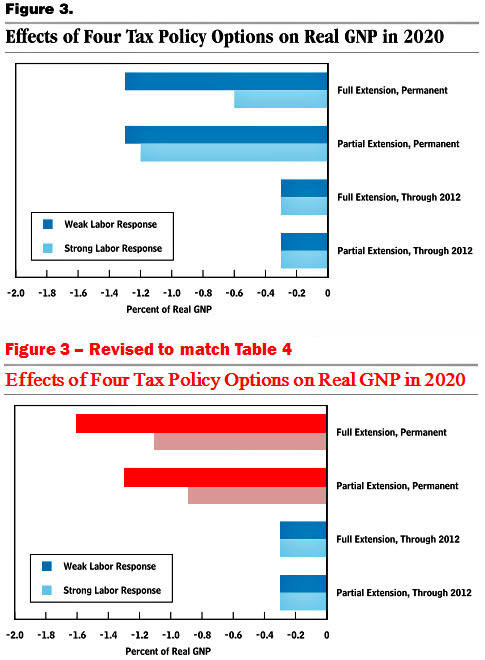 The revised chart (in red, at bottom) shows that full extension has a stronger negative effect than a middle class extension. This seems more intuitively correct. I’m not actually sure of that, though. Mainly I just want to know what CBO’s real opinion is. Is the chart correct or is the table correct? Or am I comparing the wrong things? I’ve got an email out to CBO to ask about this, and I’ll let you know if I hear back. UPDATE: My email provider decided to bounce my emails to CBO, so I never got a reply. However, I think I’ve figured out where the numbers in the chart came from. Unfortunately, that just prompted a followup question. Details here.